I think the key here is to let your chicken marinate for at least 30 minutes, but up to 8 hours. Then you’ll just need to chop up your veggies and pineapple and throw it all together. Serve over cooked brown rice, quinoa, or eat as is. Notes: We like our Chinese food a little ‘saucy’ and a little spicy. You can adjust amounts accordingly. In a small bowl, whisk together aminos/soy sauce, broth, honey, garlic, ginger and pepper flakes. Place chicken in a large shallow dish or Ziploc bag. Pour soy sauce mixture over chicken, tossing gently. Cover and refrigerate for at least 30 minutes or up to 8 hours. Heat oil in a large non-stick skillet over medium-high heat. Add chicken and marinade and sauté for 5-10 minutes or until chicken is cooked through. Remove chicken from pan and reserve. Add broccoli and cook for about 3-5 minutes. Then add the sliced carrots and bell peppers and cook for 5 minutes or until vegetables are slightly tender. Add pineapple and cook for 2 more minutes. Add reserved chicken back to the pan. Whisk together the water (or broth) and corn starch and stir into the pan to thicken the sauce. Serve over brown rice. 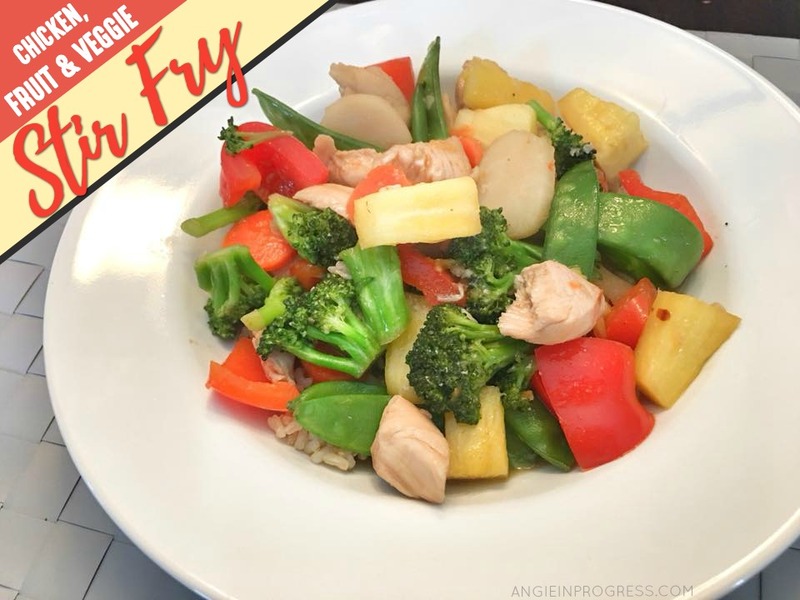 This recipe made about 6 servings and fits perfectly in to the container systems for programs like 21 Day Fix and 80 Day Obsession. Have the programs and the containers but need some help planning, feeling motivated and accountable? Join my next support group for free!